I am back in the bedroom again! Back in June, I co-blogged about the effects a good bed has on one’s posture with an image consultant, who wrote about the positive impact a good night’s sleep has on one’s personal image. When it comes to the bedroom though, there’s much more to consider. The ideal bedroom is a harmonized space. It serves your needs, comforts, and tastes. When those three elements are incorporated and balanced together, then there is harmony in the bedroom and you can fully enjoy it. Harmonizing a bedroom space should be important to you because a bedroom is not only about color, line, and design. It is about the hidden things that most people don’t see, such as electrical live wiring in your ceiling and surrounding walls. It’s about the wired clocks and cellular technology sitting on the nightstand next to your bed. It’s about the electricity emanating from the television sitting across from your bed while you attempt to sleep. We don’t think about how our bodies are filled with so much water and minerals that attract electric current, but yet we surround our sacred sleeping spaces with all of these electric accouterments! It’s no wonder we’re all running around like live wires all day, and leaving people a potentially strange impression of ourselves due to a lack of good sleep and rest. Your bedroom can easily be accessorized just like you accessorize yourself or other parts of your home. 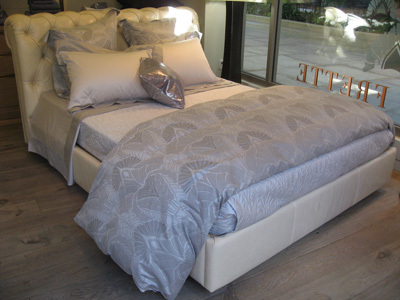 The bedroom should not become filled with “dust collectors” that detract from the calm energy of the space. To create a space of understated elegance, maintain a line of simplicity, and a soothing color palette of a minimum of three colors. The colors should be complementary and pleasant to look at together. Often people are lured by the notion of a high thread count sheet; however, the most important consideration is how well the bedding fabrics are finished. Did you know, for instance, that Egyptian cotton is not only grown in Egypt but also here in the U.S.? The Egyptian grown cotton grows longer and is more durable, due to the climate and growing conditions, making it the ultimate in luxury. Mixing fibers, like wool and silk or silk and cashmere, are so pleasant and elegant to look at. When those fabrics envelop your body, they make you feel like royalty. Going to bed isn’t just about what happens between the sheets. Why, after creating such a sensuous room, do so many people wear T-shirts and sweat pants around the bedroom and into the bed? This incongruous behavior is a total disconnection from the harmonized concept of the bedroom and from your brand. Even when there is no one else around but you and your mate (or even just yourself), and you think this is the time to let yourself go, think again. In fact, this is the time to be at your best to relax, unwind, share intimate moments and dreams. Indulge yourself with the pleasure of owning loungewear, pajamas, and robes that are compatible with the quality of your bedroom space for relaxing, napping, and sleeping. 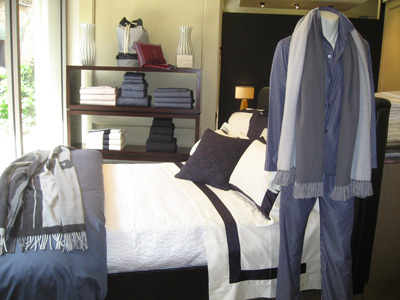 (Photo was taken inside Frette Store by Valentina Cirasola with permission). This weblog is superior it has bought the entire factors i sought right after to talk about, it has fulfilled my wisdom, i just appreciated this weblog and that i wish to subscribe so are you able to please inform even though your blog gets up to date and what?s the process to subscribe in particulars. Thank you for reading my articles on various subjects of style, architecture and designs. To subscribe to my blogs, you can leave your email address in the box email subscription. Sleeping is the most important activity of our day and it will affect our productivity if we don’t have a good night sleep every night. As a designer, it is very important to me to inform on all aspects of design and how it influences our life.